The Institute, based close to Ealing Common in London, has trained people in the psychological therapies for over 30 years. It presently has around 1200 students and candidates on a wide range of part-time undergraduate and postgraduate courses, in areas ranging from counselling and psychotherapy to coaching and therapeutic writing. Simon leads a Faculty that comprises four doctoral programmes – a Doctorate in Psychotherapy by Professional Studies, a Doctorate in Psychotherapy by Public Works, and, most recently, an MPhil/PhD, alongside the DCPsych. The Director of Studies (Senior Management) role reports to Simon and the postholder will join a well-established staff team. The DCPsych programme has run successfully for 12 years, and currently has 160 candidates. Simon explained the job’s core. ‘The incoming Director of Studies will work closely with me and with the Director of Studies (Research). The role we’re now advertising will lead on teaching and day-to-day management and, crucially, the postholder will also have the opportunity to bring their ability to be innovative and their professional vision to bear. ‘The ideal applicant will have some experience of programme management – not necessarily at doctoral level, but we want someone to whom this is not new territory. 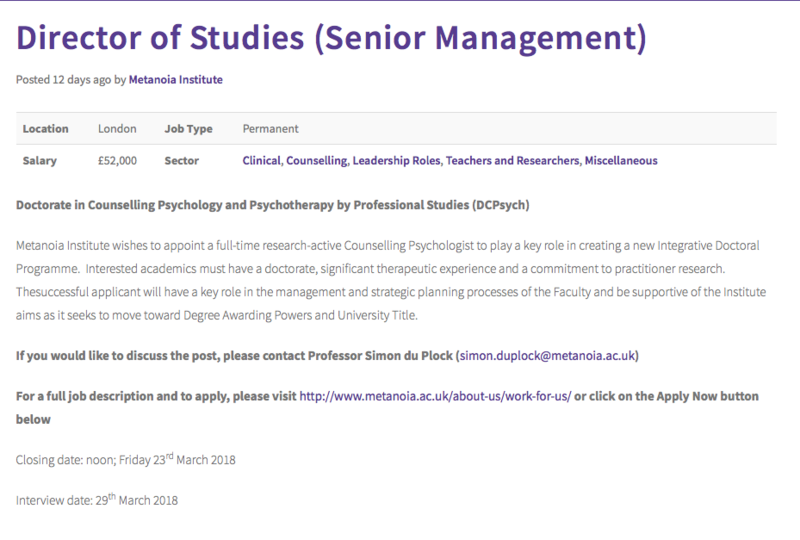 Find more about the job, and click here for yet more Jobs in Psychology.